An ocean water desalination plant is now delivering high-quality drinking water to San Diego County customers. Since this is a new drinking water supply, the State has lowered mandatory conservation targets for homes and businesses served by the plant. This is good news for neighborhoods and ratepayers because it recognized local efforts to improve our water supply as well as community-wide sacrifices that save water. Thank you for your support of water conservation. For more information, please click on the Quick Links above. For more information about the statewide drought emergency, visit the Emergency Water Conservation website. 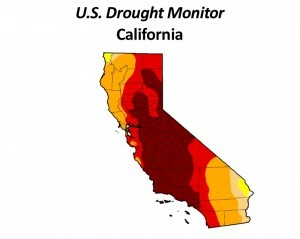 To learn more about the state’s drought response, visit drought.ca.gov. For steps every Californian can take to conserve water, visit saveourwater.com. Click on image to visit the U.S. Drought Monitor website.